With Lumenis’ CO2 ablative technologies skin damage and tone are significantly improved with minimal downtime. This is due to their unique pulse technologies and tailored treatment modes. The Lumenis™ CO2 ablative technologies enable a high rate of improvement for skin damage and skin tone with minimal downtime. This is due to their unique pulse technologies and tailored treatment modes. The ablative technologies are available in the UltraPulse® and AcuPulse™ products. Lumenis offers a range of ablative and non-ablative resurfacing solutions tailored to each practice and each patient’s needs and preferences. Lumenis CO2 ablative resurfacing: Lumenis’ ablative technologies dramatically decrease scars, even very deep ones, as well as repair damaged skin and improve skin tone. Treatment is free of complications and requires minimized downtime due to the unique pulse technologies and tailored treatment modes. The ablative technologies are available in the UltraPulse™ and AcuPulse™ products. Lumenis offers a complete laser blepharoplasty solution that combines an incisional solution with complementary eyelid resurfacing. The AcuPulse™ as well as the UltraPulse™ systems have an incisional handpiece that provides excellent surgical precision during treatment. 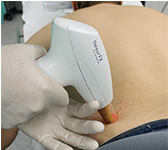 With laser assisted incisions, bleeding during the procedure as well as post-surgery bruising are reduced. The systems are also equipped with fractional ablative skin resurfacing modes that offer excellent skin rejuvenation results in the surrounding periorbital areas. The Lumenis Q-Switched Nd:YAG is very effective for the removal of dark tattoos and the safest for skin of color. Using a top-hat beam profile ensures control of homogeneous energy delivery and maximum safety without hot-spots nor any risk of side effects or complication for the patient. The versatility of 5 spot sizes allows to use the ideal parameters for the clearance of dark tattoos. The Lumenis IPL with OPT™ (Optimal Pulse Technology) is designed to treat vascular lesions up to 1.5 mm deep and up to 1 mm in diameter. The Multi-Spot Nd:YAG with Multiple Sequential Pulsing (MSP) effectively treats vascular lesions up to 4.5 mm deep and with a diameter of up to 4 mm, such as leg veins. The Multi-Spot Nd:YAG treats all skin types safely and effectively. The Lumenis’ LightSheer® systems (INFINITY™, DESIRE™, add DUET™ ) uses 805nm diode laser technology that has become the well-established method for permanent hair reduction. The LightSheer technology by Lumenis has been validated in numerous clinical studies and peer reviewed articles. Our customers benefit from the LightSheer features and enjoy high patient satisfaction. The Lumenis ResurFX™ is the only true Fractional Non-Ablative solution on the market. It uses an advanced scanner technology called CoolScan™. CoolScan uses a sophisticated, patent-pending algorithm for non-sequential scanning which ensures that the energy delivery is precise and homogenous, so the required coverage is achieved in only one pass. The ResurFX™ module is available as part of the M22 multi-application platform. Pigmented lesions are hypermelanocytic areas typically induced by sun exposure, the natural aging process or congenital factors. Pigmented lesions vary widely in size, shape and depth. They can be either raised or flat and are usually a cosmetic rather than a medical concern. Intense Pulsed Light (IPL) which targets the melanin is effective in treating benign lesions and clearing them. The Lumenis IPL with OPT™ is considered the industry’s ‘Gold Standard’ for treatment of vascular lesions and its efficacy has been proven in over 80 peer reviewed papers (IPL bibliography of studies and peer reviewed articles). 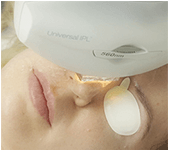 Lumenis’ IPL with OPT can coagulate each sub-type of capillaries, reducing the redness and simultaneously triggering neocollagenesis which limits the reccurrence of the condition. Lumenis offers a range of ablative and non-ablative fractional resurfacing solutions to treat different degrees of scar. The SCAAR FX™ mode available as part of the UltraPulse® system, allows for advanced treatment of a variety of severely damaged skin lesions which require synergistic coagulation and ablation for advanced resurfacing (SCAAR). As a pioneer in aesthetic medicine, Lumenis developed the first IPL technology and the first Photorejuvenation platform. The Company has established itself as long-standing leader in the field due to its vast knowledge and expertise in the market. The Lumenis IPL with OPT™ is considered the ‘Gold Standard’ in photorejuvenation treatments and its efficacy has been proven in over 80 peer reviewed papers (IPL bibliography of studies and peer reviewed articles). Lumenis Legend M2TM is a clinically proven and tested combination therapy for ablation and skin resurfacing and to treat wrinkles and rhytides. It is a combination treatment for greater efficacy, with TriPollar® RF and VoluDerm™ technologies targeting different skin layers individually.